A giant size version of the classic game! 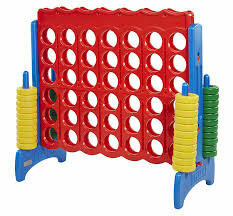 This giant connect four set stands about 4 feet high. Take turns dropping your game pieces into the frame, and try to form a line of four while keeping your opponent from doing the same.